Leaves are falling, Autumn is calling! Explore these autumnal applications harvested from around the State of Minnesota. Plan a trip to view fall colors all around the state by using the DNR Fall Color Finder. 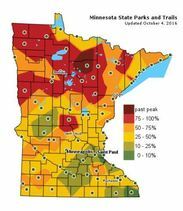 Search for fresh apples, cider, pumpkin and more fall goodies using the Minnesota Grown Interactive Map. This application helps to promote Healthy Eating initiatives in Hennepin County by providing easy information about farmer’s markets, mini-markets, and farm stands. We would love to know what you're thinking! What interests you? How do you use Hennepin County GIS Maps and data? Please take a minute to complete our brief survey.